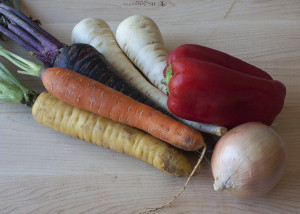 We got a little behind with our posts this week – fighting off colds so we could keep our plans for a weekend getaway left us with not much energy to write or cook – but here’s a great idea for this weekend: Winter Vegetable Chili! Sunday night, we made a recipe that we’ve been waiting to try again for a long time: Winter Vegetable Chili from “Food + Wine”. 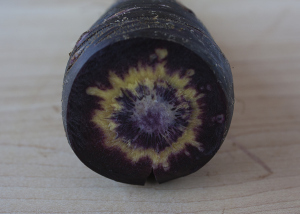 We used some very colorful Black Dirt Region rainbow carrots that we got from Fresh Direct (www.freshdirect.com), including the beautiful, deep, dark purple one in the photo below, to give this recipe a different look. Tony describes how this dinner came together.